Last summer, my wife and I had the pleasure of meeting two elderly Polish women while on vacation in Canada. Although, I never asked their age, I assumed based upon the conversation they were in their 70’s. At a beautiful outdoor café in Quebec Province, they told us their story of how their parents fled communist Poland in the early 1960’s. Under great hardship, uncertainty, and duress, both of their families settled in the Boston area. They made a new life in the U.S., rather than endure the yoke of the hammer and sickle of communism. They met while young girls at their local Church. They each married, raised families, and prospered spiritually and socially. The families socialized together, and bonded over shared values and a similar view of the world, and have remained life long friends. It was obvious in the course of the discussion the respect they had for each other. Now, with their children grown, the two women nearly sixty years later were thinking this may be the last vacation of its kind. What impressed me most about them was the sensibility about the reality of our day. Looking out over the beautiful Saint Lawrence River, both women lamented the direction of the United States heading fast into what they once fled. They were clear the signs were not ambiguous. 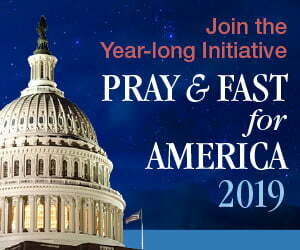 They both felt Canada had lost its faith foundation, and the speed of the loss of faith in the U.S. was accelerating. Both were steadfast that it was faith that allowed their families to have the courage to leave their home in Poland, and that faith would sustain them in the future. Faith was their rock, and their raison d’etre (reason for being) for living. Both were visibly shaken as they were certain where America was headed if it continued to abandon faith as the bedrock of its culture. Neither felt that it could be reversed outside of some spiritually spectacular event that would bring it back to its senses. They prayed it would happen, but they didn’t know how it would come about. Soviet dissident Alexander Solzhenitsysn at the Harvard Commencement in 1978 gave an hour-long address that was called, A World Split Apart. Shortly after that it was modified and was called in writings, The Exhausted West. 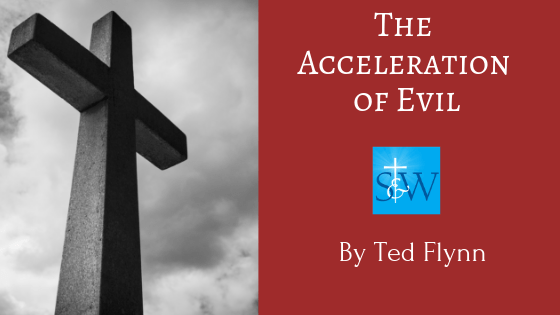 In 1983 he was awarded the Templeton Prize and largely focused his talk on the intersection of state and faith, and the severe crippling affects of a nation that is not Christocentric in its governance. He died in Moscow in 2008 at the age of 90. As an acute observer of socialism, communism, and abusive state policies lacking any humanity of faith, Solzhenitsyn painted a bleak picture for a culture that advocates, endorses, and embraces a godless state. This is what was spoken about at the outdoor café on the Saint Lawrence without ever mentioning his name. Solzhenitsyn was a giant among men in this genre. As a prisoner of the gulag for over ten years, he saw what the system was like personally. It wasn’t taught in some political philosophy class. He did not learn about the “merits” of communism (socialism) from a tweedy professor at a school teaching one class per semester, having summers off, and every seven years taking a sabbatical touring the café’s of the former USSR, while tuition rates soared. Communism plays out in homes and on the streets much differently than it does in the classroom. Rarely has the professor ever known what a profit and loss (P&L) statement ever looked like, as academia has been kind to itself living off government grants and largesse to keep the ruse going. At the end of World War II, as the GI’s came home and finished their education on the much deserved GI Bill, many a professor learned the hard way not to abuse the soldier who had known war and death of brothers, friends, and family. War wasn’t theory to battle scarred men and women, and they would not tolerate junk philosophy based on the theories of Karl Marx. On more than one occasion, a tenured professor found themself on the floor looking up due to spouting nonsense and destructive ideologies. The GI had no tolerance for theory. The softness of the academic culture came about through creature comforts, and lack of dutiful work, and the largesse that enabled professors to talk like that was from a pampered lifestyle existing in the vacuum of a safe classroom. Think Senator Bernie Sanders and that ilk. Sanders is the biblical definition of a fool who never had a paid job until 53 years old (a public one) and has mooched his way on public welfare his entire life. Spouting a communist manifesto of “free everything,” while he has three homes and a luxurious sports car —all supported by the government dole. It reminds one of Lenin’s comment how people can be used as “useful idiots,” for their purpose. Since then I have spent well-nigh fifty years working on the history of our Revolution; in the process I have read hundreds of books, collected hundreds of personal testimonies, and have already contributed eight volumes of my own toward the effort of clearing away the rubble left by that upheaval. But if I were asked today to formulate as concisely as possible the main cause of the ruinous Revolution that swallowed up sixty million of our people, I could not put it more accurately than to repeat: Men have forgotten God, that’s why all this happened. What is more, the events of the Russian Revolution can only be understood now, at the end of the century, against the backdrop of what has since occurred in the rest of the world. What emerges here is a process of universal significance. And if I were called upon to identify briefly the principal trait of the ENTIRE twentieth century, here too, I would be unable to find anything more precise and pithy than to repeat once again: Men have forgotten God. Solzhenitsyn is speaking in 1983 but issues a warning to the west based upon what he saw coming. The West has yet to experience a communist invasion; religion here remains free. But the West’s own historical evolution has been such that today it too is experiencing a drying up of religious consciousness. It too, has witnessed racking schisms, bloody religious wars, and rancor, to say nothing of the tide of secularism that, from the Middle Ages onward, has progressively inundated the West. 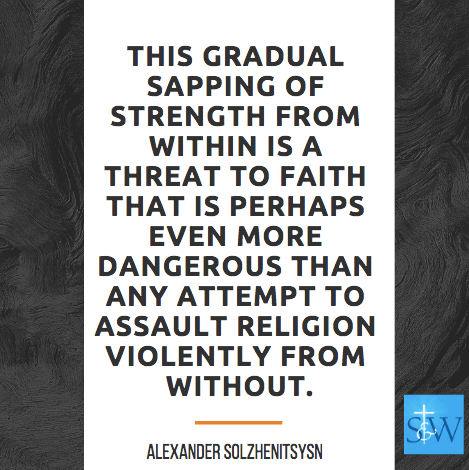 This gradual sapping of strength from within is a threat to faith that is perhaps even more dangerous than any attempt to assault religion violently from without. The remainder of the speech is lengthy and insightful on the reasons for the moral decline of the West, and the United States in particular. He was clear in articulating that the perversion of Christian teaching is far worse to a nation than a violent enemy from without. He said often that courage was the single most necessary virtue for the believer, lest the culture fall to a godless state. He felt the single most dangerous issue for a nation state was an irresponsible and controlled press. – A genius doesn’t adjust his treatment of a theme to a tyrant’s taste. – Unlimited power in the hands of limited people always leads to cruelty. – Talent is always conscious of its own abundance, and does not object to sharing. – In our country the lie has become not just a moral category, but a pillar of the state. – Man has set for himself the goal of conquering the world but in the process loses his soul. – Every man has handy a dozen glib reasons why he is right not to sacrifice himself. – All Communist Parties, upon attaining power, have become completely merciless. But at the stage before they achieve power, it is necessary to use disguises. – The solemn pledge to abstain from telling the truth was called socialist realism. – – – Untouched by the breath of God, unrestricted by human conscience, both capitalism and socialism are repulsive. – The concept of good and evil have been ridiculed for several centuries; banished from common sense, they have been replaced by political or class considerations of short- lived value. In all of sports, when the game is at the end and the score is close, there is a flurry of activity as teams go for broke to win the game. 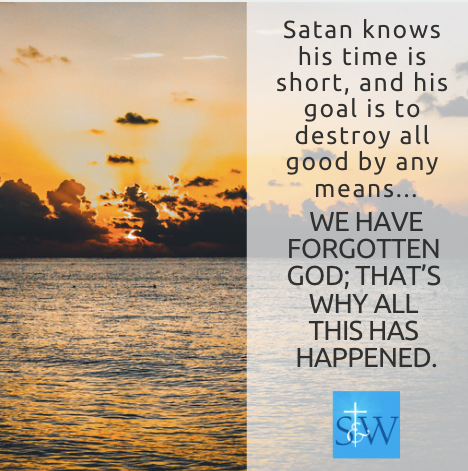 The increase in evil we see around us is due to the fact Satan knows his time is short, and his goal is to destroy all good by any means. The war again is, WE HAVE FORGOTTEN GOD; THAT’S WHY ALL THIS HAS HAPPENED.